ACLU - The ACLU works in the courts, legislatures and communities to defend and preserve the individual rights and liberties guaranteed to all people in this country by the Constitution and laws of the United States. To learn more about volunteering for the ACLU or if you are an attorney interested in offering your services pro bono, please contact your local ACLU affiliate. ABA Lawyer Referral Services - American Bar Association links to lawyer referral services across the U.S. Also see ABA National Pro Bono Opportunities Guide. Abolitionist Law Center - A public interest law firm inspired by the struggle of political and politicized prisoners, and organized for the purpose of abolishing class and race based mass incarceration in the United States. The Abolitionist Law Center engages in litigation on behalf of people whose human rights have been violated in prison, produces educational programs to inform the general public about the evils of mass incarceration, and works to develop a mass movement against the American penal system by building alliances and nurturing solidarity across social divisions. Adalah - Legal center for Arab minority rights in Israel. Arizona Justice Project - Examines claims of innocence and manifest injustice, and provides legal representation for inmates believed to have been failed by the criminal justice system. Asian Americans Advancing Justice - Asian Law Caucus - Legal and civil rights organization serving the low-income Asian Pacific American communitiesin the U.S.
Bankruptcy Pro Bono Resource Locator - Maintained by ABI World. Bar Pro Bono Unit (UK) - Acts as a clearing house, matching barristers prepared to undertake pro bono work with those who need their help. Brennan Center at New York University School of Law - Part think tank, part public interest law firm, part advocacy group - the Brennan Center combines scholarship, legislative and legal advocacy, and communications to win meaningful, measurable change in the public sector. Offers many opportunities for volunteer lawyers to work with our staff on litigation, policy research, and public advocacy efforts. Brick Court Chambers (UK) - Undertakes pro bono work on a wide range of issues. Works closely with Advocates for International Development (A4ID), Bar Pro Bono Unit and the Free Representation Unit. California Lawyers for the Arts, Inc. - A nonprofit tax-exempt service organization that provides lawyer referrals, dispute resolution services, educational programs, publications and a resource library to artists of all disciplines and arts organizations. California Indian Legal Services (CILS) - The first Native American-controlled law firm organized to provide specialized legal representation to Native Americans and Indian tribes. CILS provides free or low-cost representation on those matters that fall within the priorities set by its Board of Trustees. Created by California Indian leaders and public interest attorneys, CILS has been one of the preeminent advocates for the rights of Native Americans and Indian Tribes for over thirty years. California Rural Legal Assistance, Inc. (CRLA) - Working for economic justice and human rights on behalf of California's rural poor. CRLA has 21 offices, many in rural communities from the Mexican border to Northern California. Each year, it provides more than 40,000 low-income rural Californians with free legal assistance and a variety of community education and outreach programs. Center for Constitutional Rights (CCR) - Dedicated to advancing and protecting the rights guaranteed by the United States Constitution and the Universal Declaration of Human Rights. CCR is committed to the creative use of law as a positive force for social change. Community Rights Counsel (CRC) - A nonprofit, public interest law firm based in Washington D.C. that was formed in 1997 to assist communities in protecting their health and welfare. Creating Law Enforcement Accountability & Responsibility (CLEAR) - Housed at the City University of New York (CUNY) School of Law, CLEAR primarily aims to address the unmet legal needs of Muslim, Arab, South Asian, and other communities in the New York City area that are particularly affected by national security and counterterrorism policies and practices. City University of New York School of Law: Clinics - CUNY Law's clinical program is a fully operational public interest law firm within the law school. Its clinics offer students a unique opportunity to practice public interest law, build valuable lawyering skills and gain hands-on experience in a supportive environment. Each year, its clinics provide legal representation to hundreds of people who otherwise would not have access to justice. Directory of Pro Bono Programs - Prepared by the American Bar Association. Earth Justice Legal Defense Fund - Has provided legal representation at no cost to more than 700 clients, from the Natural Resources Defense Council and the Wilderness Society to community-based coalitions. Equal Justice Initiative (EJI) - Provides legal representation to indigent defendants and prisoners who have been denied fair and just treatment in the U.S. legal system. Equal Justice Under Law - A non-profit civil rights organization, founded in 2014, dedicated to providing pro bono legal service to those most in need. The organization is headquartered in Washington, D.C., and brings cases nationwide. It was founded and continues to be run by Phil Telfeyan and Alec Karakatsanis, its two attorneys. FindLaw: State Legal Aid Resources - Compilation of legal aid programs indexed state by state. Foundation for Fundamental Rights - An organization of attorneys and socially active individuals working towards the advancement, protection and enforcement of fundamental human rights. Free Representation Unit (UK) - Provides legal advice, case preparation and advocacy in tribunal cases for those who could not otherwise obtain legal support, for want of personal means or public funding. Haitian Lawyers Leadership Network - A Haitian-led capacity building organization that brings together a network of lawyers, artists, students, Haitian activists, cultural experts, workers and human rights organizations, advocates, government officials and progressive radio, press and media outlets to support and work cooperatively with Haitian freedom fighters and grassroots organizations promoting the civil, human and cultural rights of Haitians living at home and abroad. Housing Rights Initiative (HRI) - Takes a proactive and systematic approach to targeting, investigating, and fighting fraudulent real estate practices, improving the conditions of rental properties, and connecting tenants to legal support. Through a legal mobilization effort, HRI lays the foundation for tenants who have been overcharged and defrauded by their landlords, to seek redress and secure their rights under the law. Human Rights First - Support human rights activists who fight for basic freedoms and peaceful change at the local level; protects refugees in flight from persecution and repression; helps build a strong international system of justice and accountability; and makes sure human rights laws and principles are enforced in the United States and abroad. Identity Project, The (Papers, Please!) - Provides advice, assistance, publicity, and legal defense to those who find their rights infringed, or their legitimate activities curtailed, by demands for identification. Impact Fund - Provides strategic leadership and support for litigation to achieve economic and social justice. Provides funds for impact litigation in the areas of civil rights, environmental justice, and poverty law. Institute for Public Representation (IPR) - Public interest law firm and clinical education program at Georgetown University Law Center. Its attorneys and law students act as counsel for groups and individuals who are unable to obtain effective legal representation on matters that have a significant impact on issues of broad public importance. Currently, the Institute staff works in three project areas: civil rights, communications law, and environmental law. International Commission for Labor Rights (ICLR) - Based in New York. Coordinates the pro bono work of a global network of lawyers committed to advancing workers' rights through legal research, advocacy, cross-border collaboration, and the cutting-edge use of international and domestic legal mechanisms. On occasion, ICLR's legal network also responds to urgent appeals for independent reporting on gross labor rights violations. International Labor Rights Fund (ILRF) - An advocacy organization dedicated to achieving just and humane treatment for workers worldwide. International Senior Lawyers Project (ISLP) - Provides pro bono services of skilled and experienced lawyers to promote human rights, equitable and sustainable economic development and the rule of law worldwide. Assists governments and non-governmental organizations working to advance the rights and well-being of their citizens and helps build the capacity of the legal profession to meet the needs of their communities. Katrina Legal Aid Resources Center - Resources for people affected by the hurricanes, for legal aid and defender programs helping them, and for private attorney volunteers. Latino Justice - Using the power of the law together with advocacy and education to protect opportunities for Latinos to succeed in school and work, fulfill their dreams, and sustain their families and communities. Lawyers Without Borders LWOB) - The world's largest group of volunteer lawyers from around the globe who stand ready to offer pro bono service to worldwide projects and initiatives. LWOB is also a portal and clearinghouse for legal needs and organizations in search of legal resources as well as a vehicle for addressing Human Rights Issues through sometimes traditional and, more often, innovative channels. We encourage our colleagues in the Rule of Law sector to contact us when their projects call for high-caliber or specialized staffing needs. La Raza Centro Legal - Founded in 1973, La Raza Centro Legal provides direct legal services, education, leadership development, and opportunities to organize around community issues. As a bilingual and multicultural staff, we seek to create a more just and inclusive society in the interest of the Latino, indigenous, immigrant and low income communities of San Francisco and the greater Bay Area. Our programs in employment, housing, immigration, naturalization, senior and youth law enable people to exercise their legal rights, confront injustice, increase self-sufficiency, and advocate for themselves. With a passion for justice, we work with our clients to build and support a societal commitment to respect the dignity and rights of all communities. Lawyers' Committee for Civil Rights of the San Francisco Bay Area (LCCR) - Champions the legal rights of people of color, poor people, immigrants and refugees, with a special commitment to African-Americans. Legal Action Center - Provides legal advice and representation to New York State residents who: 1) Face employment, housing and other types of discrimination because of a criminal record; 2) face discrimination because of an alcohol/drug history; or 3) have HIV-related legal problems. Legal Aid Society of New York - Provides legal services to individual clients often involving children, seniors, persons with disabilities, survivors of domestic violence, immigrants, uninsured families and individuals, persons moving from welfare to work, homeless children and families, persons with HIV/AIDS and persons with mental illness. Legal Services Corporation (LSC) - The Congress of the United States entrusts the Legal Services Corporation with a dual mission: to promote equal access to justice and to provide high-quality civil legal assistance to low-income Americans. Surveys indicate that 80 percent of the need is unmet. Also see Wikipedia article for more information and a listing of LSC programs throughout the U.S.
Legal Services for Children (LSC-SF) - Provides free legal and social work services to children and youth in order to stabilize their lives and help them realize their full potential. 1254 Market St. 3rd Floor, San Francisco, CA 94102. Legal Services for Prisoners with Children (LSPC) - Works in partnership with other organizations and grassroots activists to promote change in California's criminal justice system. Engages in impact litigation, as counsel or co-counsel, and occasionally as a plaintiff. Recent cases are in the area of prison conditions, including solitary confinement. Regularly engages in organizing campaigns in collaboration with numerous other organizations, including CURB Coalition partners throughout the state of California. Legal Services of New Jersey (LSNJ) - Legal services for the economically disadvantaged. Louisiana Civil Justice Center (LCJC) - A non profit that provides civil legal assistance for low-income, elderly, and disaster-affected residents of Louisiana through a toll-free hotline, court-based help desks, and community legal clinics. Military Law Task Force - The National Lawyers Guild Military Law Task Force assists those working on military law issues as well as military law counselors working directly with GIs. It trains and mentors counselors and beginning military law attorneys in all aspects of military law through training materials and direct communication. It updates changes in military law and policy. Milton A. Kramer Law Clinic Center - A law firm within the Case Western Reserve University School of Law staffed with eight full-time faculty members who have years of practice experience themselves. Under their supervision, law students represent clients and client groups who can't afford their own lawyers. The clinic handles more than 100 cases per year for a total of approximately 16,000 hours of pro bono legal work. Mississippi Center for Justice - Providing legal advocacy on behalf of racially disadvantaged and low-income people and communities. MFY Legal Services, Inc. - Provides free legal assistance to residents of New York City on a wide range of civil legal issues, prioritizing services to vulnerable and under-served populations, while simultaneously working to end the root causes of inequities through impact litigation, law reform and policy advocacy. NAACP Legal Defense and Educational Fund, Inc. (LDF) - Founded in 1940 under the leadership of Thurgood Marshall. Although LDF's primary purpose is to provide legal assistance to poor African Americans, its work over the years has brought greater justice to all Americans. National Consumer Law Center (NCLC) - A nonprofit advocacy organization that seeks to build economic security and family wealth for low-income and other economically disadvantaged Americans. Promotes access to quality financial services and protect family assets from unfair and exploitive transactions that wipe out resources and undermine self-sufficiency. National Lawyers Guild - Dedicated to the need for basic and progressive change in the structure of our political and economic system. Through its members--lawyers, law students, jailhouse lawyers and legal workers united in chapters and committees--the Guild works locally, nationally and internationally as an effective political and social force in the service of the people. National Security Counselors - Founded to further the twin ideals that the public needs to be as informed as possible about what its government does in the name of national security, and that people entangled in legal matters in this field should have reasonable access to knowledgeable legal assistance, regardless of income. To that end, NSC exists to perform four primary functions: to lawfully acquire from the government material related to national security matters and distribute it to the public, to use this material in the creation of original publications discussing the respective subjects, to advocate for intelligent reform in the national security and information and privacy arenas, and to provide a low-cost alternative to certain deserving clients involved in security law or information and privacy law-related proceedings. NC Justice Center - Take on high-impact cases that protect and expand the rights of workers, consumers, immigrants, and low-income families in North Carolina. New York Lawyers for the Public Interest (NYLPI) - NYLPI is a not-for-profit legal office. NYLPI finds unique ways to tackle the problems facing low-income and underrepresented people throughout New York City. Online Media Legal Network (OMLN) - A network of law firms, law school clinics, in-house counsel, and individual lawyers throughout the United States willing to provide pro bono (free) and reduced fee legal assistance to qualifying online journalism ventures and other digital media creators. Palestine Legal - Dedicated to protecting the civil and constitutional rights of people in the U.S. who speak out for Palestinian freedom. Provides legal advice, Know Your Rights trainings, advocacy and litigation support to college students, grassroots activists and affected communities who stand for justice in Palestine. Prison Law Office - Strives to improve the living conditions of California state prisoners by providing free legal services. Pro Bono and Public Service Volunteer Opportunities - Information provided by the American Bar Association. 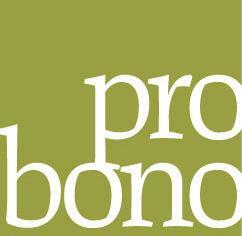 Pro Bono Institute - A respected resource for all things pro bono. By providing expert consultations and technical assistance, educational programming, and local, national and global pro bono convenings, its goal is to improve and enrich pro bono service. Pro Bono Net - An innovative attempt to use information technology to better connect and organize the public interest legal community in an online environment. Includes online communities based in New York, Minnesota and San Francisco. Pro Bono Net/SF - Provides links to resources for volunteer lawyers seeking pro bono opportunities. Provided by the Bar Association of San Francisco. Pro Bono Students Canada - University of Manitoba. Pro Bono Students Canada (PBSC) - A network of law schools, community organizations and lawyers that facilitates law students' pro bono work with public interest and non-governmental organizations, agencies, tribunals, legal clinics and lawyers who are working pro bono on a particular case. Pro se - Information to those persons who do not have an attorney to represent them. When you are without an attorney, you are "proceeding pro se. If you represent yourself in court, you are called a "pro se litigant" or a "self-represented litigant." Pro se is a Latin, legal term meaning "for himself," and a "litigant" is someone who is either suing someone or is being sued in court. Pro Bono Students Canada (PBSC) - University of Toronto. - A national network of law schools and community organizations that matches law students who want to do pro bono work with public interest and non-governmental organizations, government agencies, tribunals and legal clinics during the academic year and during the summer. Public Interest Clearinghouse (PIC) - Provides support, technical assistance and coordination for over one hundred nonprofit legal aid programs in California and Nevada that have, as their primary business, the delivery of civil legal assistance to low-income and other under-served citizens. Public Justice - Marshals the skills and resources of over 3,000 of lawyers to fight for justice through precedent-setting and socially significant litigation. Fighting for for consumers' rights, workers' rights, civil rights and civil liberties, environmental protection, public health and safety, and access to the courts. Reprieve - Provides frontline investigation and legal representation to prisoners denied justice by powerful governments across the world, especially those governments that should be upholding the highest standards when it comes to fair trials. Reprieve lawyers represent people facing the death penalty, particularly in the USA, or when those facing execution are British nationals. And Reprieve lawyers represent prisoners denied justice in the name of the 'War on Terror,' including those held without charge or trial in Guantánamo Bay and the countless secret prisons beyond. None of these prisoners can afford to pay for representation. Southern Environmental Law Center (SELC) - Addresses major environmental issues in southeast United States. SELC has a highly credentialed team of about 45 attorneys, many of whom have been there for 15 years or more. SELC does not charge clients and partners for our services, but relies instead on charitable gifts from individuals, families and foundations. Sylvia Rivera Law Project (New York) - Works to guarantee that all people are free to self-determine gender identity and expression, regardless of income or race, and without facing harassment, discrimination or violence. Taxpayers Against Fraud False Claims Act Legal Center - Dedicated to combating fraud against the government and protecting public resources through public-private partnerships. Texas Appleseed - Promotes social and economic justice for all Texans by leveraging the skills and resources of volunteer lawyers and other professionals to identify practical solutions to difficult systemic problems. Washington Legal Clinic for the Homeless - Provides representation of individual low- and no-income clients in Washington D.C., through a network of over 200 volunteer attorneys and legal assistants. Women's Center for Legal Aid and Counselling (WCLAC) - The WCLAC, established in 1991 in Jerusalem as an independent Palestinian organization. Provides support and guidance to Palestinian women whose human rights and rights under the law have been violated. Defends women's rights as human rights and seeks to promote the development of a social, political and legal order in which human rights are well respected and women's rights are well protected. This webpage last updated on Wednesday, February 6, 2019 4:38 PM.